The Travels of Mariko Horo reverses the “Marco Polo Syndrome,” the symbol of Western Man exploring, categorizing, and analyzing the exotic East. The exoticizing gaze thinks itself a magnifying glass but is in actuality a half-silvered mirror. The traveler means to describe new lands, new peoples, new cultures, but in reality sees images of his own culture superimposed over a vague and exotic background. Mariko Horo was also inspired by Japanese artists who, while Japan was closed to the outside world, constructed the West in their fantasy as an exotic and unknowable universe. They had only a few maps, books, and prints but enhanced them with their own fertile imaginations. For Japanese artists trying to imagine the West, and Western artists trying to imagine Japan, the power of imagination could often take them only as far as a vague, pseudo-Chinese fantasy – for both Far East and Far West the epitome of “foreign” and “exotic.” This geographic confusion finds echoes in Mariko’s Last Judgment scenes, inspired equally by Byzantine Christian frescos and Tibetan tankas. 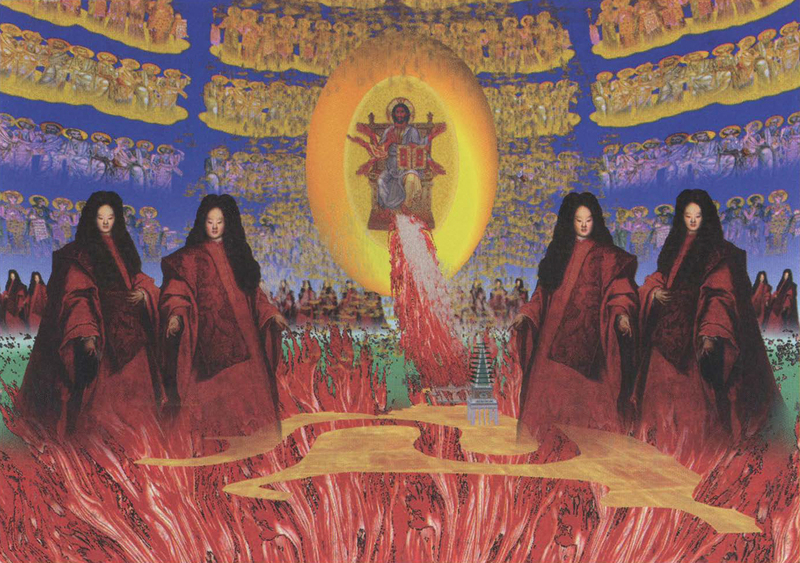 Mariko’s vision also reflects the “hidden Christians” in Japan who, while Christianity was forbidden on pain of death, secretly venerated images of the Buddhist Goddess of Mercy, Kannon, as the Christian Madonna. Why did my Japanese-American grandfather convert from Buddhism to Christianity, becoming a minister and intending to return to Asia as a missionary? How did he reconcile his new faith with the darker side of Christianity, the conflict between the American promise of “one nation under God, with liberty and justice for all,” and the reality of the Japanese-American internment during World War II, or KKK preachers who burnt crosses and human beings with equal fervor? How does Christianity appear today to those caught in the crossfire of our current “crusades”? users into key locations in the virtual world, where proximity sensors recognize and react to their presence. Switching large amounts of geometry on and off in real time, the program transports users into another realm, in the same way as entering a sacred space in the real world can transport us into a different cosmology. The program misuses particle systems to populate these realms with clouds of angels and swarms of the damned. Three-dimensional sound enhances the sense of space and presence as users move through a reactive and sensitive world. Interactivity between the user and the world turns users’ decisions into a play on Christian free will and determinism, as users’ conscious choices are punished or rewarded, sending them to heaven or to hell. Buddhism, however, is cyclical, so users can subvert the linear structure of Christian theology, even escaping hell to be reborn in the mortal world.